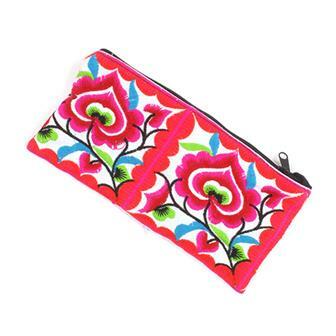 Have a look at our fantastic mix of colourful clutch bags and wallets here! All Fair Trade and ethically sourced from suppliers around the globe. Complete your look with one of our very special wallets. 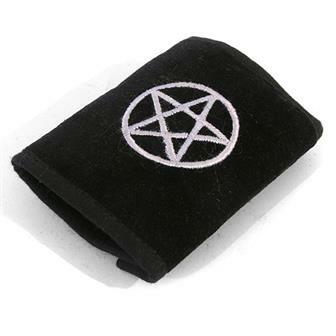 Black velvet wallet embroidered with a pentacle design. The wallet is cotton lined with two zip pockets and ample space for cards. A pentacle is a pentagram surrounded by a circle used to invoke a spirit or energy. The outer circle of the pentagram is sometimes interpreted as binding the elements together or bringing them into harmony with each other. 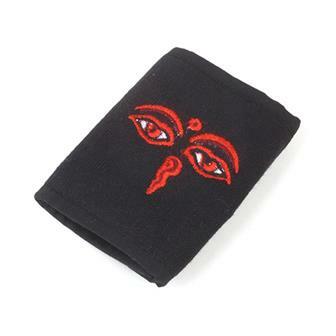 Simple black cotton wallet embroidered in a variety of classic deigns in various colours.This lined wallet features various compartments for bank notes, cards and a zipped coin compartment and a sturdy Velcro clasp. 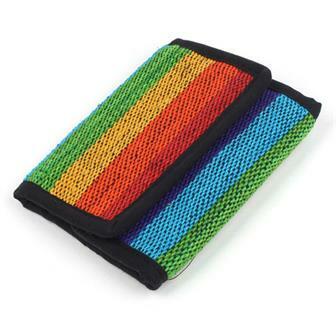 Rainbow wallet made with heavy duty gheri cotton in rich, vibrant colours that show the sturdy weave of this material. The wallet is lined with standard black cotton, has a generous velcro fasten and two zipped pockets (one for coins and one for notes) as well as three open pockets for all your cards. 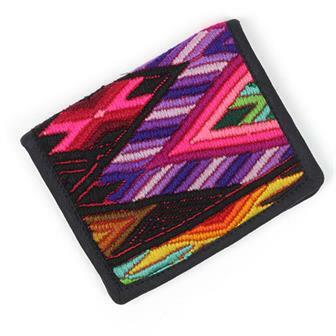 Lined cotton wallets made with various panels from recycled huipils, a traditional garment of Central and South America. The fabric from the huipils is often made with hand operated back-strap looms and can be specific to certain regions or even individual villages, each often bearing intricate and meaningful designs. Each wallet has three separate spaces for cards, a large space for bank notes and a small zipped internal compartment as well as velcro clasp. All colours, patterns & fabrics vary. These large, sturdy clutch purses feature a fantastic arrangement of vibrant embroidery in a floral and bird pattern reminiscent of Latin American designs. Handmade in Thailand, these chunky pieces have tons of room inside with dedicated card holders and four internal divisions for notes and receipts. Embroidery colours and pattern varies. 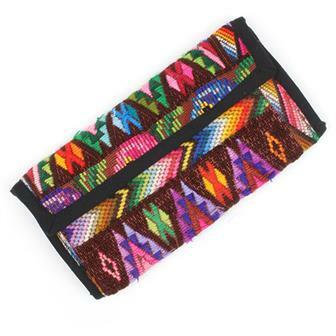 Large cotton wallet/clutch bag with shoulder strap which featuring a large panel of handmade fabric produced on a back-strap loom from the Chichicastenango (affectionately referred to as Chichi) region in Guatemala which is famous for its weaving. The fabric features intricate geometric and floral patterns. These Thai clutch-bag style purses feature three separate zipped pockets making them perfect as a make up bag or travel bag. 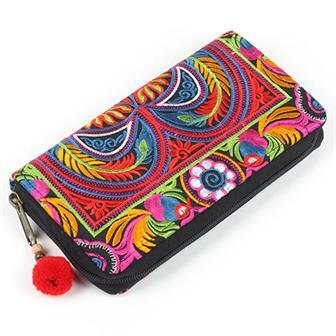 Each purse is hand decorated with wonderfully colourful Thai embroidery. 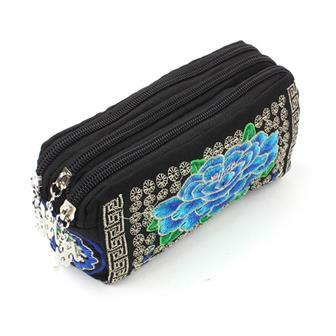 Perfect for use as a make up case or as a handy clutch bag, these intricately embroidered purses are both beautiful and functional. Each purse is handmade in Northern Thailand.